Wet horse, rider and gear I can deal with but trying to keep my competition breeches whiter than white in these conditions is near enough impossible. 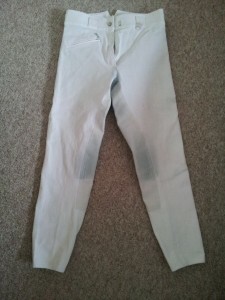 It rained so hard that the dye from my black saddle leached out leaving inky blue stains on the knee and seat areas of my breeches. There also appeared to be a multitude of other assorted stains and marks all over me by the end of the day (heaven knows where they came from!) 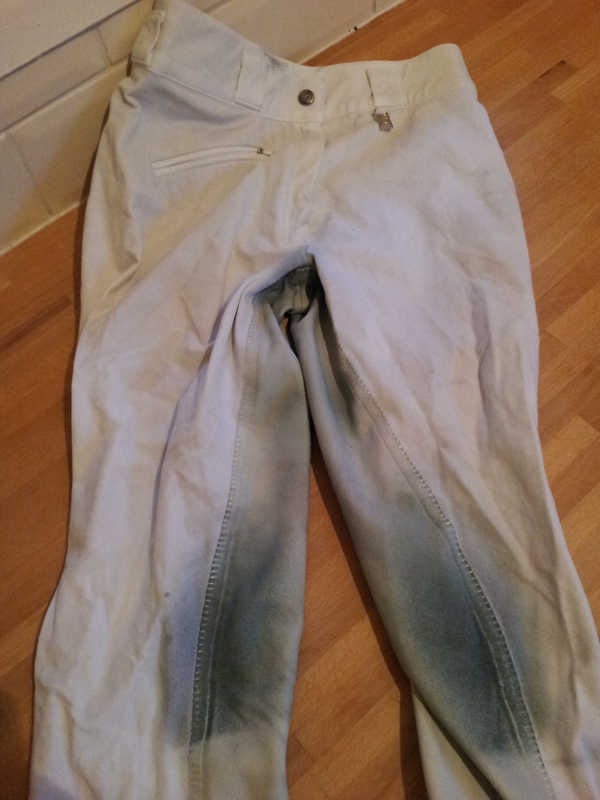 I looked like I had been playing rugby not dressage! In the vain hope that they ‘might just wash out’ I chucked my breeches in a normal 30 degree wash and crossed my fingers. This is what came out. Now admittedly they were cleaner…they just weren’t clean! 5/ Giving up all hope of wearing them in competition again and dying them a darker colour! 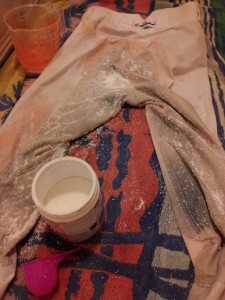 It is semi-terrifying applying bright orange Swarfega to previously white, and originally very expensive breeches, but I thought there’s nothing to lose so ‘in for a penny…. I applied and scrubbed them all over with the Swarfega, and then applied the Vanish directly on top of that. 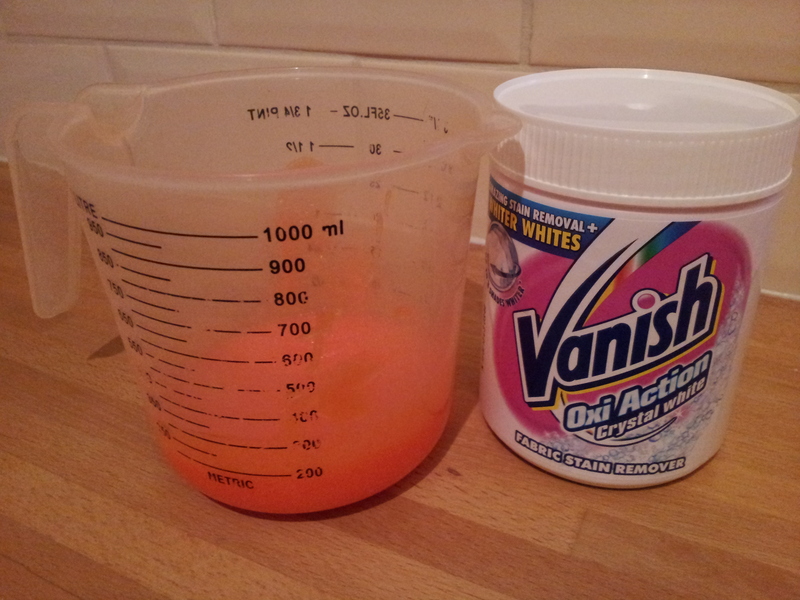 I left them like that for about 5mins, and then I soaked them in a bath of Vanish solution for 3 hours. At this stage I was slightly freaking out by their increasingly orange appearance! 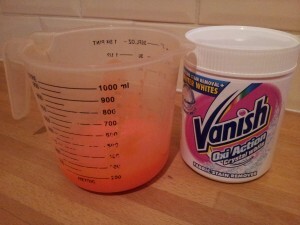 After 3 hours soaking in a warm Vanish solution I put them in the washing machine, added a scoop of Vanish to the wash, and put them on a 30 degree cycle. When they finally came out they did look cleaner, but not great, but as they dried they started to look a lot better. I am pleased they are back to a wearable colour again, but there are still residue stains and marks on them when you look up close (OCD alert! ), but that it not the end! I have a secret weapon up my sleeve…..mother! I mentioned my Daz white challenge issues to her and in true mother style she said ‘give them to me, I’ll see what I can do’ so fingers crossed she can use some ‘mother magic’ and improve them further still! One small jump for Dustry, one HUGE leap towards becoming an eventer!